Being a little mischievous is part of being a dog, and for the most part, behavioral issues can be addressed with the right kind of training. There are instances, however, when dog owners accidentally encourage their dogs to pick up bad habits. These undesired behaviors develop slowly until they’re second nature for the dog. There’s no such thing as a point of no return, but it’s definitely harder to break a dog’s bad habits than it is to teach good habits right from the start. The sooner you realize you’re teaching your pup poor manners, the sooner you can change their behavior for the better. Countless dog owners don’t realize they’re accidentally teaching their dogs to do these four things. We all know what it feels like to be deemed powerless by a pair of puppy dog eyes. They’re so persuasive, a stare down can end up costing you most of the food on your dinner plate. 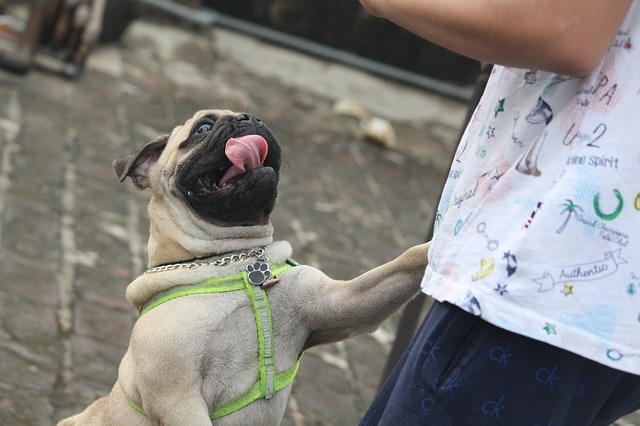 Giving in to your dog’s plea for food, however, will start a long spiral of begging behavior. Once the dog figures out your weakness, they won’t hesitate to take advantage of it. Tossing them food from your plate reinforces the idea that begging gets them what they want. Soon they’ll move on to more intrusive behaviors like invading your personal space when you’re trying to eat and stealing food right from your fingers. You can also try engaging your dog in other activities while you eat. Give them their own meal or if your dog knows a “place” command, have them spend the entirety of your mealtime at their place. If your dog knows “go to your mat,” for example, have your dog go to their mat and stay there instead of crowding the table. When your meal is finished, reward your dog’s good behavior with a treat while they’re still on their mat. A dog jumping on you to say hello can almost be seen as a compliment. It means they’re overjoyed to see you, and who doesn’t love being on the receiving end of a dog’s affection? That mindset is exactly why countless dogs develop the bad habit of jumping on people they meet. Their owners think it’s adorable and funny, and dog people most often respond by laughing and giving the dog plenty of pets. That type of reaction serves as positive reinforcement and teaches the dog that jumping is a good thing. Some people excuse their dog’s behavior because either their dog is too small to do any real damage or because they secretly enjoy the attention. But jumping on people is problematic behavior for several reasons. First, not everyone is going to appreciate your dog putting their paws on them. Big or small, overenthusiastic dogs can be intimidating to your friends and family not used to being around dogs. There’s also the issue of it being dangerous. If your large dog jumps on an elderly person, they could easily knock them down and cause a serious injury. The same thing can happen to kids. Instead of encouraging the behavior by giving your dog a reaction, you deter jumping by not reacting at all. Your dog jumps because they think it’ll give them what they want, which is the person’s attention. Instead of laughing or scolding, do the opposite of what your dog wants. That means you turn away and ignore them. Wait until all four paws are on the floor before going in for the greeting. If they jump again, turn around again. When you have guests over, it’s best to keep your jumping pup on a leash until they break the habit.